An investigation has been launched into the cause of the crash. TWO PEOPLE HAVE been confirmed dead after a small aircraft crashed near Belfast International Airport earlier today. 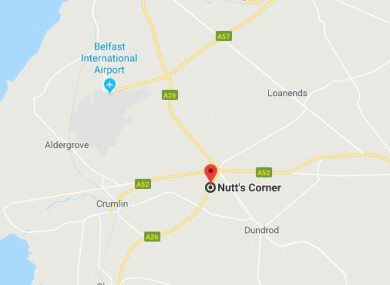 The aircraft crashed in the vicinity of Nutts Corner, Crumlin, Antrim at around 12.20pm this afternoon. The PSNI and other emergency services, including the Northern Ireland Ambulance Service, attended the scene. One rapid response paramedic, three emergency ambulance crews and four officers were dispatched to the incident by the Northern Ireland Ambulance Service. The charity air ambulance was also tasked to the scene. The Air Accidents Investigation Branch is to examine the scene to determine the cause of the crash, according to the PSNI. “Cordons have been placed in the area surrounding the aircraft to maintain the integrity of the scene as the investigation continues,” a statement from the PSNI said this evening. “Cordons have been placed in the area surrounding the aircraft to maintain the integrity of the scene as the investigation continues. I would ask that the cordons are respected by all and directions from officers at the scene are heeded,” it said. The PSNI said it is not in a position to confirm the identity of the deceased at this time. Belfast International Airport has said it is operating as normal following the incident. In contrast to the Northern Ireland Ambulance Service, the airport said the aircraft was not approaching for landing. “The aircraft was not operating into or out of the airport,” the statement from the airport said. Email “Two people confirmed dead after small aircraft crashes near Belfast International Airport”. Feedback on “Two people confirmed dead after small aircraft crashes near Belfast International Airport”.